Who said that eating healthy means bland taste and greens all over? With the Healthy Food Guide, eating healthy and being healthy is one culinary adventure. What I like most about this food site is in the way they have categorized content. You can choose by health information (dairy-free, gluten-free,high calcium, high fibre, high iron, low fat, low kilojoule, low sodium, vegetarian), main ingredient (choose from a wide array of meat and veggies! ), meals and occasions (dare I list the choices? baking, barbecue, breakfast, casseroles/stews, Christmas, curries/Asian-style, desserts, dressings, drinks, homemade takeaways, mains, marinades/rubs, one-dish meals, pasta/rice/noodle dishes, pies/tarts/flans/fritatas, preserves, roasts, salads, sauces, side dishes, snacks/light meals, soups, starters/dips, stir-fries), seasons (spring, summer, autumn, winter), recipe by (with a list of experts), recipe types (5pm panic!, back to basics / step by step, freezes well, how to cook, kids can cook, low cost, makeovers, meals for one, no/minimal cooking, reader recipes, ready in 20 minutes, sponsored recipes). If the above description is not a clear indication of the wealth of information you can get from this site, I don't know what will! And here's another nifty innovation. Got some ingredients in the ref but don't know what to do with them? Click on the recipes tab on the top menu bar, and on the next page you will see a sidebar at the left of the screen. Click on the advanced tab and choose three ingredients you see in your ref. Voila! Recipes to maximize your ref assets. 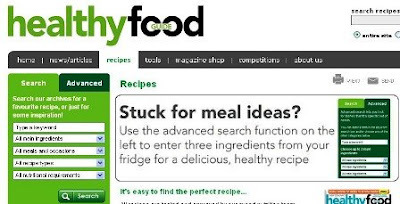 Complete with nutrition information, cost of ingredients, portions, time to make, detailed instructions, and enticing photos, this website will surely make you come back for more healthy eating options. Hi Kim. I think your site is just awesome!